February 26 Program (yes, THIS Monday) at 10 a.m. Please join us Monday morning at 10 a.m. and welcome our guest speaker from Tubac Presidio State Historic Park. We will be learning about the history of the Presidio and what we can expect on our tour at the end of March during the field trip. Our field trip buses are filling up. If you plan to join TWOQC on March 26 for the trip to Tumacácori National Historic Park and the Tubac Presidio make your reservations soon. Seats will be sold before Monday’s program. Your $40 gets a seat on the bus (including gratuities), entrance to both sites with guided tours and a fabulous lunch at the The Italian Peasant in Tubac. Join your fellow members and take a tour of history in this part of Southern Arizona. Remaining seats on the buses will be available to the general Quail Creek female population after Monday evening so if you want to go make sure you make arrangements now. Can’t attend Monday’s program? Contact Peggy at pjmcgee@cox.net to make reservations. Cereal, Fruit, Water, Jelly, Spaghetti, Refried Beans, Rice or Potato Sides, Canned Beef/Chicken, Snacks such as Trail Mix, Granola Bars or Jerky. If you have any of these items to contribute, please bring them to Monday’s program and put them in the YOTO bin at the back of the ballroom. Can’t come to the program? Drop them at Diane Quinn’s house, 2276 E. Skywalker Way. Please bring donations of toiletries, calendars/notecards/playing cards/books/snack items to the program on February 26 and place them on the table at the rear of the ballroom. If you have any paper plates or napkins left over from Christmas, the Super Bowl, Valentine’s Day please consider donating them to the homeless veterans rather than letting them clutter your cabinets. Disposable cups and utensils are needed too. Packages may be opened. Thanks so much to a member who donated a like-new double stroller for the homeless veteran with two young children. The VA social worker reported the female veteran was most appreciative. Welcome to our newest arrivals! We have been blessed with 2 babies born, a boy and a girl. We are at 26 families registered for the baby shower! (Maximum is 30 families). Please bring any donations of outfits, onesies, blankets, diapers, baby wash/powder to the program on Monday morning and help us fill up our table in the back of the room… the famous “Baby Bottles” will also be there to collect any spare change or loose dollars you may want to contribute. Many “thanks” to all who have already donated! Monday, March 12 at 7:00 PM in the Crystal Ballroom, the third lecture in the Kino Lecture Series will take place. Jason Winfield of Lone Mountain Turquoise Company will share his expertise of American turquoise; how to collect and know what you are buying. Mr. Winfield will be available in 5-minute segments from 4:00 – 6:00 p.m. to evaluate up to 3 pieces of your turquoise jewelry. The cost is $10. Tickets to the lecture ($5) and evaluation session sign-up ($10) will be available at the Concierge (checks only payable to TWOQC Charity Fund); at the February 26 program and at the door (cash or check). 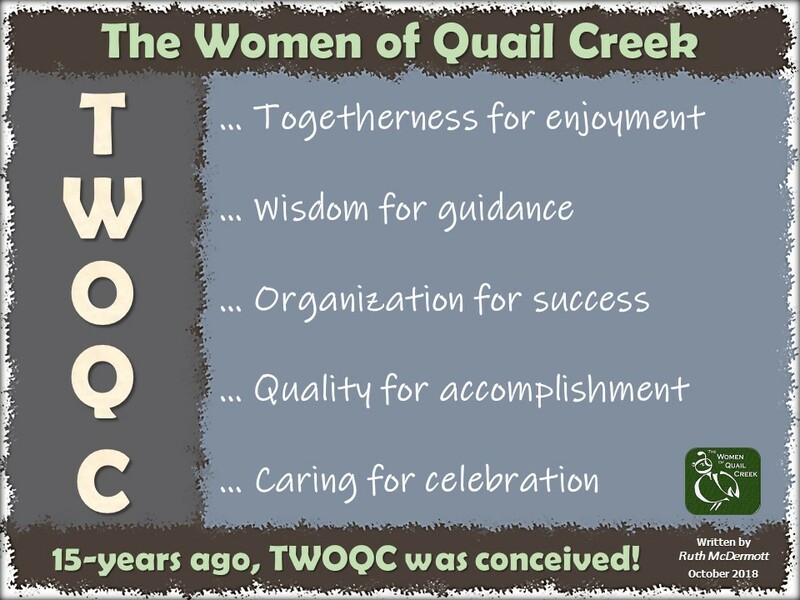 All proceeds from both the lecture and the evaluations support TWOQC’s Scholarship Fund. The next Honor Flight #24 from Tucson to Washington, DC will be this Mother’s Day weekend May 12-14. Participating veterans will visit the war memorials dedicated in their honor. The residents of Quail Creek are asked to write generic letters (“To a Hero”; “To a Veteran”) for the Veterans traveling on this flight. These letters will be distributed during Mail Call, and kept secret until the return flight. Veterans will very much appreciate your letters thanking them for what they did all those years ago. Let them know that the sacrifices they made – being away from loved ones and friends in an often hostile environment, risking their lives every day, and facing all the other realities of wartime – were acknowledged and appreciated. You are encouraged to write a short note or a longer letter, whatever you can do. Let these humble veterans know that what they did so many years ago to preserve the freedoms we enjoy today is appreciated. Names of the 23 vets are not available yet. Please place letters outside Kay Robinson’s home, 898 N Kenneth Drive, before April 30th or bring to the TWOQC April program. TWOQC’s Honor Flight Representative is Kay Robinson. As those of you who have worked at our clothing drive know, we fold a lot of clothing. We are looking into purchasing a few clothes folding boards like they use in department stores to speed up our process. However, before we purchase any boards, if anyone of our members has one of these boards and no longer wants it, please consider donating this to our clothing drive. Contact Laura Colbert at clothingdrive@womenqc.com. Thank you. “Thank you” to this week’s FMM contributors: Laura Colbert, Kathi Krieg, Peggy McGee, Diane Quinn, Kay Robinson, Angie Werner, and Julie Woodward.